There is a giant meteor soaring towards the Earth; who is going to stop it? Click here to play! The boys from Armageddon couldn't be bothered, and the Fantastic Four are off on some other planet. The Silver Surfer is our only hope, and he needs you to aid him! Play Silver Surfer today; this exciting 5-reel slot is played across nine lines of payout madness. The Silver Surfer logo is Scattered and can earn you up to 125 times your initial wager. The Silver Surfer himself doesn't payout, but he can be substituted for any other logo on the reels. Additionally, if you manage to find the Silver Surfer on reels 2 and 4 without Galactus on reel 3, you will receive some exciting Re-spins, which can win you a stack of cash! Team up with the Silver Surfer today for an exciting adventure to save the world! Oh, and the winnings aren't too bad, either! 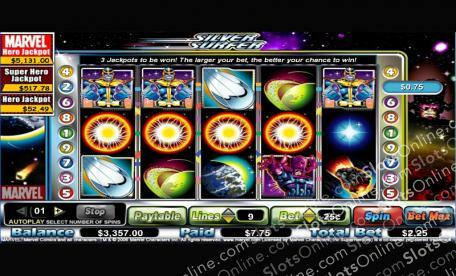 The Silver Surfer logo is Scattered and can earn you up to 125 times your initial wager when you spin up five at once. The Silver Surfer is Wild and can be Substituted for any other symbol on the reels except for Scatters. Spin him up on reels 2 and 4 and avoid Galactus on reel 3 and you will receive a horde of Re-spins!